This project will hold televisions up to 26" inside the cabinet. Larger televisions can be placed on top of the cabinet with plenty of room inside for your VCR or DVD player and lots of room left for tapes and DVD's. Project measures 39"H x 44"W x 33"D. Order #1740 Corner TV Stand hardware separately. 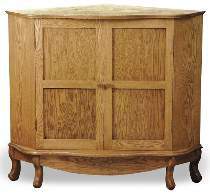 Corner TV Stand Hardware includes non-mortise hinges, shelf supports, magnetic catches and oak knobs. Project plan, wood and wood finish are not included.